Yet another study has found that low-risk patients who come to the emergency department (ED) complaining of chest pain may be able to safely go home sooner if they undergo coronary CT angiography (CCTA). A multicenter study published in the July 26 issue of The New England Journal of Medicine found that patients who underwent CCTA were discharged an average 7.6 hours sooner than those who underwent standard screening procedures for acute coronary syndrome. And none of the patients who received the CCTA exam subsequently had a heart attack in the 28-day follow-up period. Adding CCTA not only cut the length of stay in the study but also did so with little difference in cost. It also resulted in an increase in downstream testing and radiation exposure, according to Udo Hoffman, MD, MPH, of Massachusetts General Hospital in Boston and corresponding author of the study called ROMICAT (Rule Out Myocardial Infarction/Ischemia Using Computer Assisted Tomography) II. ROMICAT II studied 1,000 participants between the ages of 40 and 74 who had no prior history of heart disease or evidence of heart damage on their electrocardiograms (EKGs) or blood tests throughout nine US hospitals. Overall costs were similar for the two treatment groups—a mean of $4,060 for patients who underwent standard ED screening evaluations and $4,289 for those who had CCTA in addition to the standard evaluations. Earlier in the year, two other multicenter studies had supported using CCTA to rule out that a patient’s chest pain was caused by acute coronary syndrome. The ACRIN PA 4005 study led by Harold Litt, MD, PhD, at the Perelman School of Medicine of the University of Pennsylvania in Philadelphia was published in The New England Journal of Medicine three months earlier than ROMICAT II. It compared CCTA with usual ED care, which includes blood work and an EKG as well as stress testing with or without imaging. It also found that patients receiving a negative CCTA exam result could be safely discharged. Another study coordinated by the Beaumont Health System in Royal Oak, Michigan, was published in the Journal of the American College of Cardiology in September 2011. That study, CT-STAT, compared CCTA with SPECT myocardial perfusion imaging and found that CCTA was a faster, less expensive alternative to SPECT perfusion imaging in low- to intermediate-risk patients. While the evidence mounts that CCTA is an effective tool for triaging chest pain in the ED, its use is not without controversy. Some cardiologists, including Budoff, believe that with this much evidence, busy EDs with the expertise should make CCTA routine when low-risk patients present with chest pain. “I think it should become more a standard of care and be a diagnostic option for those EDs with the expertise because it leads to significantly faster discharges,” he says. Other physicians are concerned about the amount of radiation to which patients are exposed from the contrast used during CCTA—or whether imaging is needed at all in some cases. In an editorial that accompanied the ROMICAT-II study, Rita Redberg, MD, a cardiologist and professor of medicine at the University of California, San Francisco, questioned whether any additional diagnostic test is necessary in these low-risk patients. “It’s not a population that needs this test necessarily in the ER [emergency room],” Redberg says. It is even faster to discharge low- to intermediate-risk patients from the ED without any additional diagnostic testing, after their EKG and enzymes come back normal, she says. 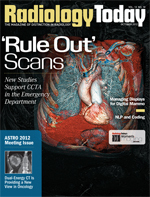 To perform CCTA, Budoff says, EDs must have at least a 64-slice CT scanner and a radiologist or cardiologist who is level 2 trained to interpret the scans. “You need more than a machine. You need someone who knows how to read cardiac CT as well,” he says. CCTA combines advanced CT scanning with IV contrast materials to produce detailed images of blood vessels supplying the heart, much like cardiac catheterization does, only the patient doesn’t have to undergo the invasive procedure. Implementing CCTA couldn’t be timelier, Budoff says. Since the US Supreme Court upheld the Affordable Care Act and more people soon will have health insurance, EDs are expected to become even more crowded. As it is, about 6 million Americans seek treatment in the ED for chest pain each year. The three recent studies, as well as earlier ones, have shown that patients with chest pain can be triaged significantly faster if they undergo CCTA. “This could represent a dramatic improvement in delivery of care at a time when we need it the most,” Budoff says. Like Budoff, J. Jeffrey Marshall, MD, of the Northeast Georgia Heart Center in Atlanta and president of the Society for Cardiovascular Angiography and Interventions (SCAI), believes CCTA can be valuable in high-volume departments. “I do think in selected clinical scenarios the use of appropriately gated CT scans is probably going to be useful … and I think it’s coming,” he says. In ROMICAT II, 8% of the 1,000 patients who came to the ED with chest pain but who did not have ischemic signs on their EKGs and whose troponin (protein that indicates heart muscle damage) test was negative were found to have acute coronary syndrome on CCTA. The doctors are looking for “the needle in the haystack,” Marshall says. Marshall believes that being able to safely and quickly discharge patients who aren’t at risk of a heart attack is valuable to everyone. “If it’s you or your mother, the difference between eight hours and 26 hours in the emergency room may be worth any extra risks CCTA might have,” he says. Performing CCTA also has an advantage should a patient return to the ED with chest pain within a month or two of initial treatment, Udelson says. “If the CCTA shows the patient’s arteries are normal and two months later that person comes back to the same ER, you won’t spend a long time looking for cardiac problems because you already know his arteries are normal,” he says. Because it involves CT, radiation exposure is a factor when performing this procedure. And those who believe it shouldn’t be ordered routinely cite radiation as a key reason. Even those who do advocate for using CCTA acknowledge that exposure to radiation is a concern. “Radiation exposure is always something to think about,” Udelson says. Litt says the radiation exposure has to be weighed against what other tests the patient may undergo. Current guidelines from the American College of Cardiology and the American Heart Association say ED patients complaining of chest pain should be observed for at least 12 hours and then undergo stress testing. While guidelines recommend treadmill stress testing without any imaging, if the patient can exercise and has a normal EKG, the most common type of stress testing is SPECT. Depending on the isotope and specific techniques used, the amount of radiation from SPECT can be much higher than that from CCTA. At institutions such as the University of Pennsylvania that have the latest generation of CT scanners, Litt says, the radiation exposure from CCTA is less than 5 mSv, whereas with SPECT it can range between 12 and 20 mSv. In another study, University of Pennsylvania researchers found that patients who underwent a second CCTA more than two years later had negative results as well. “We’ve been doing this for seven years, so we have a fair number of people who have come back after two years and had another coronary CT,” Litt says. The results suggest that it may be safe to wait even longer than two years to repeat the test, which means patients would have less cumulative exposure to radiation, he says. Another benefit to coronary CT is helping diagnose coronary artery disease, even if a patient is not experiencing an acute coronary syndrome in the ED. These patients can then undergo risk factor modification and start statin therapy, if necessary, potentially decreasing their risk of having a heart attack in the future, Litt says. Redberg says coronary CT poses unnecessary risks, including nephrotoxicity and adverse reactions from the contrast dye. She also points out that she’s unaware of data that show low- to intermediate-risk patients require any imaging studies. “They’ve shown they’re low risk by their age and type of chest pain they’re having,” she says. Taking a history and doing a clinical assessment could be enough to make a diagnosis, she says, so patients should be told to make a follow-up appointment with their doctor. “The ER is for acute illnesses and urgent illnesses, and everything else is best done in the outpatient setting with your own doctor who knows you.” Clinical follow-up is safer and in the best interests of the majority of these patients, Redberg says.